Seagate has caught up with WDC’s HGST unit and built a 7-platter, 10TB disk drive filled with helium gas. Western Digital Corporation (WDC) introduced its own 10TB Ultrastar He10 drive in December last year. This was a standard PMR tech drive, unlike the Ultrastar Archive Ha10 announced in June 2015, which used shingled magnetic recording. Helium gas has less friction than air, so disk drive platters can spin more easily and don't need to be so stiff to withstand vibration induced by air friction when spinning in a helium-filled enclosure. That means they can be thinner, leading to space inside the enclosure for an extra platter. The 3.5-inch Seagate enterprise capacity 10TB drive has seven platters, 1.43TB per platter, and 14 read/write heads. It effectively complements the existing 8TB enterprise capacity drive which is an air-filled drive with 6 platters, as there is only the single 10TB capacity point. 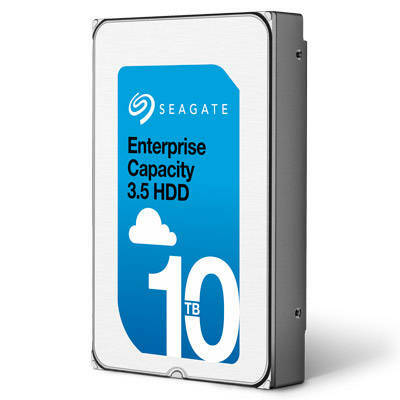 To get 2, 3, 4, 5, 6 and 8TB capacities the existing Enterprise Capacity drive products will have to be used. Seagate says its new drive has the lowest power and weight available in a 10TB drive, which should help make it appealing to cloud service providers and other hyper-scale users storing massive amounts of data. The company has added PowerChoice technology to help reduce the costs associated with power and cooling during idle time. Seagate also says it has a PowerBalance feature to help optimise the IOPS/Watt rating for more efficiency. The drive has a 2.5 million hour mean time before failure (MTBF) rating and is built to operate in a 24 x 7 environment. Seagate is not revealing the rotation speed or cache size. We're told that the 10TB product has a 5 per cent increase over the 8TB-class products in terms of nearline performance, indicating a transfer rate of around 249MB/sec, equivalent to WDC's 10TB drive performance. Seagate has also announced an 8TB NAS HDD drive, built for small business, personal cloud and multimedia storage, complementing the 8TB Enterprise NAS HDD launched in September last year. It comes with 1, 2, 3, 4, 6 and 8TB capacity points and is suitable for use in 1- to 8-bay enclosures. The workload limit is 180TB/year, which contrasts with the 8TB Enterprise NAS drive’s 300TB/year. It has a 1 million hour MTBF; the Enterprise NAS having a 1.2 million hours rating. The Enterprise NAS drive’s 5-year warranty is reduced to 3 years with this SMB NAS drive. We understand it spins at 5,900rpm, has a 216MB/sec transfer rate, and a 6Gbit/s SATA interface. NAS manufacturers such as ASUSTOR, QNAP, Synology and Thecus have qualified the drive. Pick up a pdf datasheet here. We can expect Seagate to spread this helium-based technology across its portfolio of 3.5-inch and 2.5-inch disk drives and so regain basic capacity parity with WDC. Toshiba, lacking helium-based technology is now at a capacity disadvantage with its disk drives. We could think about 11-12TB shingled magnetic recording drives using the basic 10TB PMR tech, and then 14-16TB HAMR (Heat-Assisted Magnetic Recording) drives coming along after 2017.